Apart from MiFID, the Alternative Investment Fund Managers Directive (AIFMD) may be the most important European asset management regulation of the early twenty-first century. the nexus with the European Regulation on Long-Term Investment Funds (ELTIFR). Nine country reports, representing most of Europe’s financial centres and fund markets add a national perspective to the discussion of the European regulation. These chapters deal with the potential interactions among the AIFMD and the relevant laws and regulations of Austria, France, Germany, Italy, Luxembourg, Liechtenstein, The Netherlands, Malta and the United Kingdom. The second edition of the book continues to deliver not only the much-needed discussion of the inconsistencies and difficulties when applying the directive, but also provides guidance and potential solutions to the problems it raises. The second edition considers all new developments in the field of alternative investment funds, their managers, depositaries, and prime brokers, including, but not limited to, statements by the European Securities and Markets Authority (ESMA) and national competent authorities on the interpretation of the AIFMD, as well as new European regulation, in particular the PRIIPS Regulation, the ELTIF Regulation, the Regulation on European Venture Capital Funds (EuVeCaR), the Regulation on European Social Entrepreneurship Funds (EUSEFR), MiFID II, and UCITS V.
The book will be warmly welcomed by investors and their counsel, fund managers, depositaries, asset managers, administrators, as well as regulators and academics in the field. Chapter 1 Introduction. Dirk A. Zetzsche. 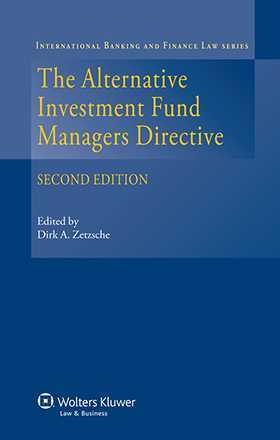 Chapter 3 Scope of the AIFMD Dirk A. Zetzsche & Christina D. Preiner. Chapter 4 Challenges from the Supervisor’s Perspective Marcel Lötscher & Patrick Bont. Chapter 5 Interplay between the AIFMD and the UCITSD Ulf Klebeck. Chapter 6 AIFMD versus MiFID II/MiFIR: Similarities and Differences Dirk A. Zetzsche & Thomas F. Marte. Chapter 7 ELTIFR versus AIFMD Dirk A. Zetzsche & Christina D. Preiner. Chapter 8 CSR, Responsible Investments and the AIFMD Dirk A. Zetzsche & Christina D. Preiner. Chapter 9 Appointment, Authorization and Organization of the AIFM Dirk A. Zetzsche & David Eckner. Chapter 10 The Liability Insurance of the AIFM Gregory Walker. Chapter 11 Delegation Thibaut Partsch & Jérôme Mullmaier. Chapter 12 The AIFM’s Governance and Remuneration Committees: The Impact of the AIFMD Paulo Câmara. Chapter 13 Liquidity Management and Side Pockets Ulf Klebeck. Chapter 14 Risk Management Dirk A. Zetzsche & David Eckner. Chapter 15 Investor Information and Reporting Dirk A. Zetzsche & David Eckner. Chapter 16 The AIFMD’s Cross-Border Dimension, Third-Country Rules and the Equivalence Concept Dirk A. Zetzsche & Thomas Marte. Chapter 17 Depositary Regulation Sebastiaan N. Hooghiemstra. Chapter 18 The AIF Depositary’s Liability for Lost Assets Christophe Clerc. Chapter 19 Depositary Liability: A Fine Mess and How to Get Out of It John R. Siena. Chapter 20 (Prime) Brokerage Dirk A. Zetzsche. Chapter 21 Securitizations Dirk A. Zetzsche & David Eckner. Chapter 22 Hedge Funds and Systemic Risk Reporting Frank Dornseifer. Chapter 23 The AIFM’s Duties upon the Acquisition of Non-listed Firms Christophe Clerc. Chapter 24 The Future of Venture Capital in Europe: Applicable Lessons from the United States Brian Park & Erik P.M. Vermeulen. Chapter 25 The AIFMD’s Impact on Dutch Real Estate Funds J.H. Bennebroek Gravenhorst & C.C. Destrée. Chapter 26 Impact of AIFMD on the Private Equity Industry Mark van Dam & Jérôme Mullmaier. Chapter 27 Art Investment Vehicles David Eckner & Randall James Willette. Chapter 28 The AIFMD’s Transposition in Italy Raffaele Lener & Chiara Petronzio. Chapter 29 (Indirect) AIFMD-Transposition into Swiss Law Guenther Dobrauz-Saldapenna. Chapter 30 The Luxembourg Implementation of the AIFMD Thibaut Partsch & Élisabeth Forget. Chapter 31 The AIFMD’s Transposition in the Netherlands Sebastiaan Hooghiemstra. Chapter 32 The AIFMD’s Transposition in Austria Julia Nicolussi. Chapter 33 The AIFMD Transposition in Liechtenstein Günther Dobrauz-Saldapenna, Annika Schwertschlag & Philip Rosenauer. Chapter 34 The AIFMD’s Transposition in the United Kingdom John R. Siena & David Eckner. Chapter 35 The Implementation of the AIFMD in Germany Thomas Emde. Chapter 36 The AIFMD’s Transposition in France Christophe Clerc.